It’s up to Highland Council now wheth­er the pro­ject can go ahead, but we’re delighted to have got this far. Below are some details from our press release. As you will have noticed the Energyshare web­site hasn’t been closed down — Energyshare decided to keep it open after many of the groups fea­tured asked them to do so. So we will con­tin­ue to keep in touch with you in this way — unless you tell us you don’t want to receive these updates. A com­munity-owned renew­able energy pro­ject has reached a cru­cial mile­stone with the sub­mis­sion of a detailed plan­ning applic­a­tion to Highland Council. The pro­ject, which has been jointly developed by two Edinburgh-based com­munity organ­isa­tions, aims to gen­er­ate clean, renew­able energy, con­trib­ut­ing to Scottish Government efforts to tackle cli­mate change. The two 750KW wind tur­bines at the heart of the pro­ject will also gen­er­ate a fin­an­cial return that will be shared between loc­al com­munity organ­isa­tions near the pro­ject and the non-profit groups that developed the ini­ti­at­ive, Greener Leith and PEDAL Portobello. Charlotte Encombe, Greener Leith Chair said: “Volunteers from both Greener Leith and PEDAL Portobello have inves­ted hun­dreds of volun­teer hours to get the pro­ject to this stage, fun­drais­ing, man­aging con­tract­ors and meet­ing with loc­al com­munity groups. The pro­ject is cur­rently 95% owned by two Edinburgh-based com­munity groups Greener Leith and PEDAL Portobello. A num­ber of com­munity organ­isa­tions loc­al to the pro­ject have already been approached by volun­teers from the pro­ject, and offered the oppor­tun­ity to invest in the pro­ject. “All over Scotland, renew­able energy pro­jects like this are gen­er­at­ing resources for com­munity groups that can help them revital­ise their areas, whilst sim­ul­tan­eously tack­ling cli­mate change and UK depend­ence on fossil fuels from for­eign coun­tries. Should the pro­ject receive plan­ning per­mis­sion, con­struc­tion of the wind tur­bines is expec­ted to begin in 2015. Our reg­u­lar read­ers will know that PEDAL volun­teers have been work­ing hard with those at Greener Leith to devel­op a com­munity owned wind tur­bine at Seafield Sewage Works. In January this year we hit a stum­bling block in nego­ti­ations over the Seafield site, in rela­tion to safety and liab­il­ity issues should there be an acci­dent involving the tur­bine. In response PEDAL and Greener Leith pro­duced options for con­sid­er­a­tion by the Scottish Government. On 28th May, Scottish Energy Minster Fergus Ewing chaired a meet­ing at Seafield involving all parties, in an attempt to find a way for­ward. However, rep­res­ent­at­ives of landown­ers Scottish Water and site oper­at­ors Veolia Water stated that the site is no longer con­sidered suit­able for a wind tur­bine due to the pos­sible need for land to expand the waste water treat­ment works in the future. While this devel­op­ment is frus­trat­ing, we are pleased to say that Scottish Water have pledged to help us find anoth­er site for a com­munity tur­bine, or to oth­er­wise help the com­munit­ies of Portobello and Leith achieve their renew­able energy aspir­a­tions. Fergus Ewing MSP will chair a fol­low up meet­ing with Scottish Water in September to review pro­gress on these pos­sib­il­it­ies. This press release below was agreed by all the parties involved in the nego­ti­ations and was issued by the Scottish Government last Friday, 8th June. Community groups, Scottish Government and Scottish Water to work togeth­er. Community groups, Scottish Water and the Scottish Government have agreed to work togeth­er to find an altern­at­ive site for a wind tur­bine owned by com­munit­ies in the East of Edinburgh. Following a meet­ing between Energy Minister Fergus Ewing, rep­res­ent­at­ives from PEDAL (Portobello Transition Town), Greener Leith and Scottish Water agreed to find an altern­at­ive site for a com­munity-owned wind tur­bine for the East of Edinburgh. The two com­munity groups had planned to erect a wind tur­bine at Seafield Waste Water Treatment Works, with money raised from the tur­bine bene­fit­ing both com­munit­ies, but the site is no longer con­sidered suit­able. The land in ques­tion provides the only poten­tial for vital expan­sion of the Waste Water Treatment Works serving Edinburgh should this be neces­sary to meet future cus­tom­er demands. At the meet­ing on May 28, also atten­ded by loc­al MSP Kenny MacAskill, all parties agreed to work togeth­er to find an altern­at­ive site, or anoth­er way for Scottish Water to work with the com­munity groups. Energy Minister Fergus Ewing said: “Scotland is lead­ing the way across the UK in how we sup­port loc­al and com­munity own­er­ship of renew­able energy, and I am determ­ined to ensure com­munit­ies all over Scotland reap the bene­fits of renew­able energy. “Although it is dis­ap­point­ing that the site ori­gin­ally iden­ti­fied can­not be used for this com­munity wind tur­bine, this was a pos­it­ive and pro­duct­ive meet­ing. “The Scottish Government and Scottish Water have agreed to help PEDAL and Greener Leith to find a site for anoth­er scheme else­where. “If a suit­able site can­not be found, Scottish Water have indic­ated there are oth­er ways they would be able to work with the Community Group, and the Scottish Government and Community Energy Scotland will explore the pos­sib­il­ity of a part­ner­ship arrange­ment with a rur­al group to help Greener Leith and PEDAL achieve their renew­ables ambi­tion. 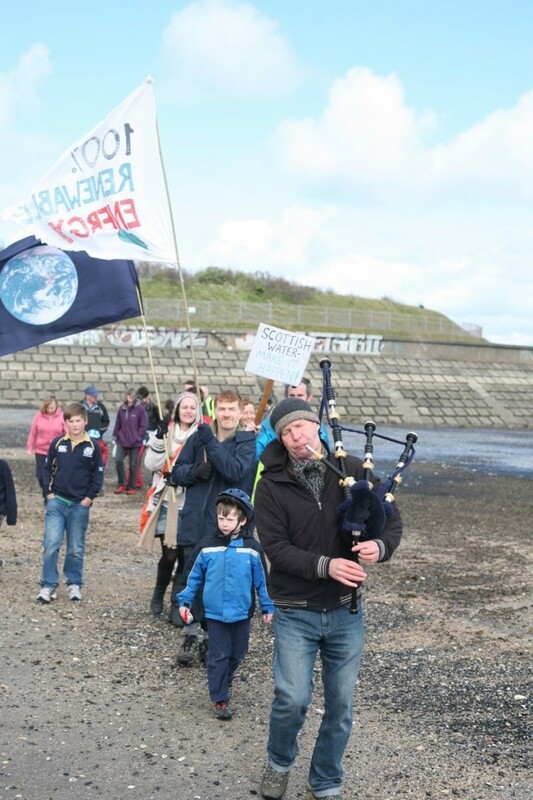 We are very dis­ap­poin­ted that our plans for the first urb­an com­munity wind tur­bine in Scotland have hit a stum­bling block after the landown­er, Scottish Water, changed their stance on the pro­ject at the start of this year. Negotiations stalled after the private sec­tor com­pan­ies that man­age the PFI con­tract at the treat­ment works deman­ded that Scottish Water accept liab­il­ity for any acci­dents involving the pro­posed tur­bine on the site. Although the risk of the wind tur­bine dam­aging the sewage works is extremely small, Scottish Water — which is 100% owned by Scottish Ministers — have said they are not will­ing to accept the risk, even though PEDAL and Greener Leith would fund an insur­ance policy as part of the pro­ject. Talks with Scottish Water and the com­pan­ies that man­age the Seafield site through a Private Finance Initiative began in February 2011. Despite receiv­ing sev­er­al writ­ten assur­ances from seni­or staff rep­res­ent­ing the organ­isa­tions involved that they would back a tur­bine on this site, it was not until 19th January 2012, nearly a year later, that Scottish Water changed their stance on the cru­cial land deal. Representatives of PEDAL, Greener Leith and Scottish Water last met on 1st February 2012 in an unsuc­cess­ful attempt to resolve the issue. Since then, hav­ing already put in many hun­dreds of hours over many months to get the pro­ject to this stage, we have attemp­ted to lobby Scottish Government min­is­ters in a bid to find a way for­ward. We’ve called on them to dir­ect Scottish Water to indem­ni­fy the PFI con­tract hold­ers from any risk asso­ci­ated with this pro­ject. Alternatively, the Scottish Government should cre­ate an indem­nity bond to cov­er com­munity renew­able pro­jects on land sub­ject to PFI. This could be covered in the future from the pro­ceeds from com­munity pro­jects that have benefited from it. To date Scottish Water has not changed its stance on the pro­ject. The extent of the influ­ence of private con­tract­ors over Scottish Water is unclear as the pro­ject requires a land deal that would last longer than the cur­rent PFI con­tract at Seafield – and the land, like Scottish Water, is ulti­mately owned by the pub­lic sec­tor. Proposals to build a single wind tur­bine on the site are the res­ult of long stand­ing col­lab­or­a­tion between PEDAL and neigh­bour­ing com­munity group Greener Leith. We already have fund­ing from the Scottish Government and British Gas Energyshare in place to take the pro­ject to plan­ning applic­a­tion and grid con­nec­tion. Expert opin­ion sug­gests that the Seafield site is the most pro­duct­ive site in the area. To date, our feas­ib­il­ity work has not uncovered any envir­on­ment­al or engin­eer­ing reas­on why the Seafield pro­ject could not pro­ceed. “We are par­tic­u­larly frus­trated that Scottish Water has taken a whole year to identi­fy these issues, dur­ing which a huge num­ber of volun­teer hours have been put into the pro­ject. Our feas­ib­il­ity work shows there are no tech­nic­al ‘show-stop­pers’ to build­ing a tur­bine here, we are the most sup­por­ted of nearly 1000 pro­jects across the UK that took part in the Energyshare com­pet­i­tion, and we have all the funds in place to take the pro­ject to plan­ning sub­mis­sion. “We are bit­terly dis­ap­poin­ted to have got this far only for the pro­ject to be stalled on what looks like a tech­nic­al­ity. “This is a dis­ap­point­ing turn of affairs for this inspir­a­tion­al pro­ject that is a res­ult of sig­ni­fic­ant com­munity efforts. The two groups held a peace­ful demon­stra­tion at the pro­posed site yes­ter­day, 28th April. Large scale wind tur­bines can be found at indus­tri­al sites in oth­er coun­tries such as England, Holland and the USA. These include tur­bines at com­mer­cial ports, chem­ic­al plants, water treat­ment and waste water treat­ment works. Those to be found in oper­a­tion in England include 1x 1,300KWp tur­bine at Hull Waste Water Treatment Works and 2x 600KWp tur­bines at Mablethorpe Sewage Treatment Works. Further, con­sen­ted wind pro­jects at waste water treat­ment works are: Bristol (4x 3,000KWp), Newthorpe in Nottinghamshire (1x 3,300KWp) and Severn-Trent in Leicestershire (1x 3,400KWp). The Scottish Government’s tar­get is to achieve 100% of elec­tri­city demand from renew­ables by 2020 and 500MW of com­munity-owned renew­ables by the same date. See their Electricity Generation Policy at http://www.scotland.gov.uk/Resource/0038/00389294.pdf for more inform­a­tion. To-date, com­munity owned renew­able energy pro­jects in Scotland have a com­bined gen­er­at­ing capa­city of 19MW, mainly in the form of on-shore wind and hydro. More than 90 PFI or PPP pro­jects exist on pub­licly-owned land around Scotland, there­fore PEDAL and Greener Leith believe it is only a mat­ter of time before oth­er com­munity renew­ables pro­jects encounter sim­il­ar prob­lems. 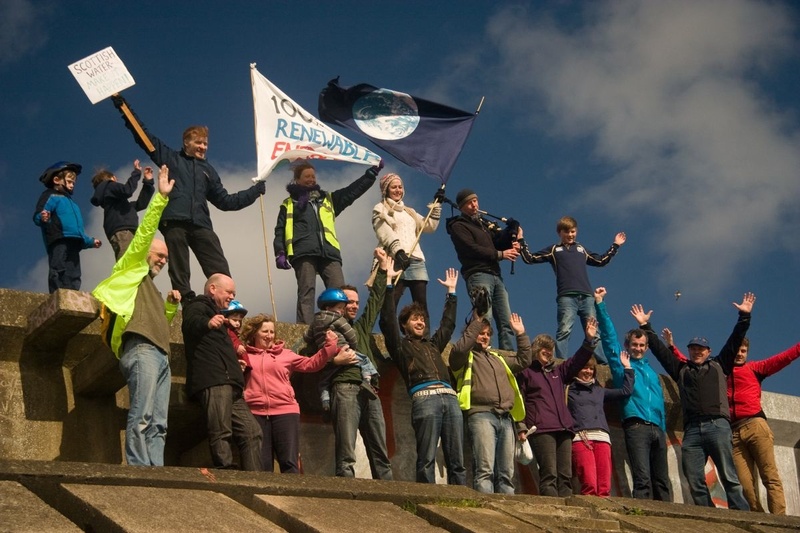 Support the Community Turbine DEMO TOMORROW (Saturday 28th April) at TEN! PEDAL and Greener Leith have hit a stum­bling block in nego­ti­ations over the deal to enable the Portobello & Leith Community Wind Turbine to be built on Scottish Water’s land. We really need loc­al people to come along to show their sup­port for the pro­ject on this tomor­row, Saturday 28th April. Please please meet on the Prom at the slip road behind the Dog & Cat Home at 10AM and we will walk/cycle/scoot to the tur­bine site. Also can any­one make a ban­ner? If so con­tact justinkenrick@yahoo.co.uk. Press pho­to­graph­ers will be present. Please pass this mes­sage on — we only have until tomor­row! A huge thank you to all who voted for us on Energyshare.com – we won, beat­ing com­pet­i­tion from nearly 1,000 oth­er com­munity renew­ables pro­jects from around the UK! And thanks also to those who passed the mes­sage round their net­works encour­aging oth­ers to vote. The prize is fund­ing to com­plete feas­ib­il­ity and site invest­ig­a­tion work for a com­munity-owned wind tur­bine on land at Seafield Waste Water Treatment Works. The fund­ing is very wel­come but just as valu­able is the demon­stra­tion of massive sup­port from loc­al people for the pro­ject. Chas was speak­ing from the Energyshare final vot­ing event in London today. That the Parliament con­grat­u­lates Strathpeffer Community Centre in Ross-shire and Portobello and Leith Community Wind Energy Project in Edinburgh for mak­ing it through to the final round of vot­ing in the Energyshare.com con­test to receive fund­ing toward com­ple­tion of their com­munity renew­ables and energy sav­ing pro­jects; notes that they are the only Scottish pro­jects to make it through to the final round and con­grat­u­lates them on what it sees as their drive and tenacity in pur­su­ing their pro­jects to this stage; notes that they have chosen St Andrew’s Day, Scotland’s nation­al day, to launch a cam­paign for Scots to sup­port their two pro­jects; notes that both pro­jects have engaged with the loc­al com­munity in the pro­mo­tion of renew­able energy and energy sav­ing; con­siders that com­munity-owned renew­ables and energy sav­ing can make an import­ant con­tri­bu­tion to tack­ling cli­mate change and redu­cing fuel bills, and encour­ages all those who sup­port com­munity-owned renew­ables and energy sav­ing to register their sup­port for these pro­jects on the energyshare.com web­site by 3 December 2011. You can also view this motion on the Scottish Parliament web­site. win fund­ing from the Energyshare fund. 19 schemes (out of nearly 1000) in a bid to win the fund­ing. entrance doors, motion sens­ing light switches and loft insu­la­tion. from com­munit­ies want­ing to gen­er­ate their own clean, green energy. pub­lic via a vote that is tak­ing place at energyshare.com/voting. vote once in each cat­egory. inspir­ing oth­ers across Britain with their excit­ing plans. the most sup­port­ers vot­ing, they can scoop a £1,000 cash prize. Out of nearly 1,000 par­ti­cip­at­ing pro­jects from across the UK, PEDAL and Greener Leith’s pro­pos­al for a com­munity wind tur­bine at Seafield Waste Water Treatment Works is in the final 19 that might win fund­ing from Energyshare! We are in the medi­um pro­jects cat­egory and so stand to win up to £80,000 towards the pro­ject. Please note you only get one vote per pro­ject cat­egory. If you are already a sup­port­er of our pro­ject on the Energyshare web­site, please note this is not the same as vot­ing! All sup­port­ers will still need to place their votes if they want us to win the fund­ing. Winning pro­jects will only be judged on num­bers of votes, not num­bers of sup­port­ers. We have pro­duced an updated set of Frequently Asked Questions for those who are inter­ested in find­ing out ore about the pro­ject and how it is pro­gress­ing. Please ask your friends, col­leagues and neigh­bours if they can sup­port us, by for­ward­ing this mail, adding the Energyshare vot­ing wid­get (avail­able on the right of this web­site or on the EnergyShare web­site) to your web­site site and/or Facebook page, or through Twitter — ask­ing them to vote for Portobello & Leith Community Wind Energy Project. Pleas note you can sign up to Energyshare using your Facebook account if you prefer this to using your e-mail account. A huge thanks you to all our sup­port­ers. We’re really pleased to have got this far, and clearly we couldn’t have done it without your help.